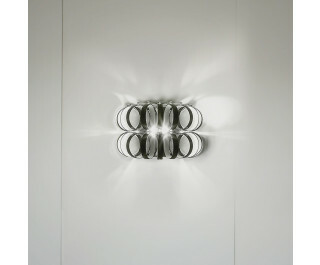 The Ecos AP wall lamp by Vistosi has been designed by Renato Toso, Noti Massarii & Associates. A system made with multiple glass rings, available in different colours and texture that offer a high level of personalization in terms of shape and size. The variety of colors is mirrored in the beauty of the light. All pieces of metal are made of chrome. You can choose the colors of the rings just as you like it.